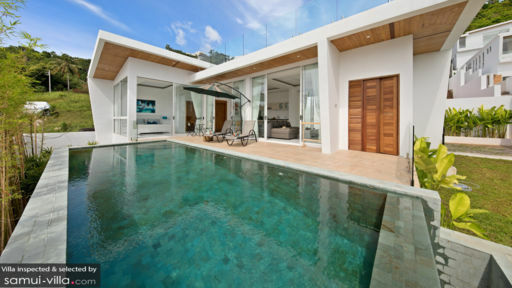 Villa Namo is a vacation residence that epitomizes contemporary Thai architecture and design. 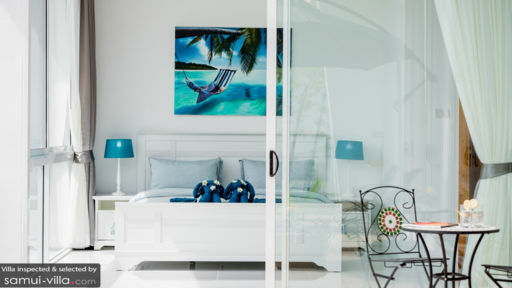 Efficiently utilizing the property’s available space, sunny and well-lit interiors – accentuated by a consistent white color scheme – are appointed with modern and chic furnishings along with elegant fixtures and luxurious pieces. Amenities are discriminatingly five star – to assure all-out guest delight and enjoyment. Villa Namo, truly, accords you comfortable and in-vogue living with a genuinely tropical ambience. The villa has two bedrooms which have king-sized beds as well as dedicated bathrooms with rain showers. One bedroom has direct access to the swimming pool, while the other has a view of the garden. Alongside the villa, bordered by tropical plants, is the swimming pool. Give in to its beckoning, glassy waters for some aimless wading, or for some playful splashing. For some sun, lazily lie on ergonomic pool beds partially covered by a large umbrella, or simply settle by the small, circular table with a cool drink – all on the poolside stone deck. From the swimming pool area, floor-to-ceiling sliding glass doors lead into the living area. Around its hefty and long couch facing a widescreen TV, you can all converge for the highly-anticipated new episode of the latest blockbuster series. Or, to relive the drama of your most beloved classic movie. Behind the couch is the dining area with its square, wooden table good for six. Here, you can all have your fill of appetizing signature dishes concocted by your designated cook at the fully-equipped, modern kitchen along the wall behind the dining area. The villa also has a furnished rooftop deck accessed via an exterior, winding stairway. With wrap-around glass railings, this open-air deck has 360-degree views of the landscape and the distant horizon – ideal for sunset cocktails and after-dinner drinks. In charge of carrying out the villa’s day-to-day services is an efficient, friendly staff headed by a multi-lingual guest manager backed by housekeepers and security personnel. A chef and a spa therapist may, upon your request, be engaged. Their services, however, come with a separate charge. Private transportation can be arranged. 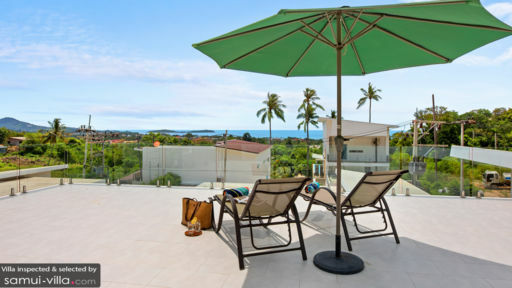 Villa Namo is located in Chaweng. Spend a day at Chaweng Beach to swim in the bay and to sunbathe on its powdery white sand. In addition to the many water sports at the beach is Aquapark Samui with its inflatable devices that will certainly bring you more enjoyment and exhilaration. You may also want to try a new sport – Football Golf – at the Samui Football Golf Club. You also must catch some Muay Thai action at the Petchbuncha Boxing Stadium. For some sightseeing, head up to Wat Khao Hua Jook where you will find a replica of Buddha’s footprint. Let loose the shopaholic in you at the Central Festival Samui, and feel the beat of the pulsating nightlife at the iconic Soi Green Mango.